Metal Bandcamp: We Doom you to......DEATH! Yeah, yeah, yeah, I'm pulling a bait and switch here on ya. This post has nothing to do with the mighty Asphyx. But now that I got you here, why not check out some of these doom bands, okay? First up is Fuoco Fatuo from Varese, Italy. After releasing two EP's, a split and a compilation, they have graced us with their debut album this year, through Iron Tyrant. Clocking in at over a hour in length through it's five songs, you know you'll need to invest some time with this one. While one would think this would be funeral doom, it stays firmly in the death/doom camp and occasionally will mix things up with some mid pace tremelo picking. As opposed to each track having its own distinct or feel, you'll want to digest this thing as a whole for maximum effect. Massively heavy, without feeling too ominous. Now what do we have here. DeMort, the guitarist of Ukrainian doom/death metal band, Amily, focusing on a solo project of symphonic and atmospheric doom under the moniker of Luna. This is one 57 minute track with no vocals (except for a haunting demonic voice right past the midpoint). Right from the get-go you can feel the emotion in the music. It oozes and drips pain, despair and misery. Yet somehow it's also uplifting at the same time. This feels like the journey of someone beaten down so severely, but they see the sunrise in the distance and their never ending will to get up and continue onward pushes them through. I found myself so lost in the music, I would ponder after 20 minutes, "is this instrumental, I don't remember hearing any vocals?" Frankly, it doesn't even need them. Quite a stunning achievement and maybe the best $4 you could spend all year. 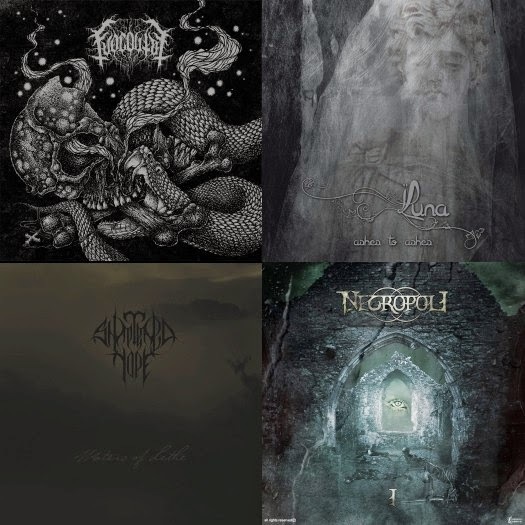 I guess I've been living under a rock all these years, as I've discovered more Greek metal bands in the past 12 months that I had in the previous 20 years. Go figure. Shattered Hope hail from Athens and gives us their sophomore effort of funeral doom/death, Waters of Lethe. This sucker clocks in at 80 minutes of wrist slashing depression. Easily the most helpless of all the bands I'm featuring in this post. Maybe the horrors of the Greek economy have something to do with it? Alas, a megaton of misery awaits your ears. These 6 sonic haunting tales of reverberation will also set you back a mere $4. We venture back to Italy for our final band. Necropoli has been around since 2011 (according to their Facebook page) but have yet to release anything until now. Their debut album, I, which was self released this past June, is not something you would exactly expect from a band that calls themselves "doom metal". After a spacey intro, the music kicks in with a furious upbeat tempo (yeah, blastbeats from a doom band). It takes a bit before you even hear the more doomy aspects of their sound. Another album with a hefty run time of 56 minutes, you get the full gamut of emotions: slow, fast, black, death, doom, techno, ambient. The album closes with an ambient atmospheric piece, that initially seems odd, but strangely feels apropos. Epic collection! Thanks for posting them!